You’ve probably heard about chatbots, if you don’t use them already. In the past few years they’ve become popular features of messaging tools like Facebook Messenger, Slack, and Skype. Sometimes you even see them pop up on websites you visit. Bots are slowly but surely integrating themselves into our digital lives. What are chatbots? In a nutshell, they are computer programs designed to simulate conversation with a human. Some bots are very advanced, using artificial intelligence to understand your queries and provide responses, and others are very simple, built on basic static templates of common questions and answers. Bots can do all sorts of things beyond just chatting like a human, such as analyze legal contracts, act as a personal shopper, give dating advice, and help manage advertising campaigns. It’s easy to see how chatbots are changing messaging, but few realize the impact they’re having on how we search for information as well. If you want to stay ahead of the SEO game, here’s all you need to know about how chatbots are changing search. While Google has shown some interest in chatbots with AI with innovations like Google Assistant and Google Allo, Bing is really paving the way for chatbot integration into the search experience today. It remains an open question whether Google will offer similar features, but with the growth of the bot industry, it seems likely that Google will integrate bots into their search results, much like they already do with mobile apps. All you have to do is click “Add bot” to add it directly to your messaging platforms like Facebook, Skype, Slack, and Telegram. The bots are named after the restaurants in question (e.g. El Gaucho bot), but they actually belong to Bing. Bing will automatically create the bot for you using your Bing Places data. Business owners just fill out answers to a few structured questions. And the really great news is that the new bots will be available across platforms, like Facebook Messenger, Cortana, Slack, and Skype. Or you can embed it in your website. It’s pretty clear that Bing is creating a lot of opportunities to improve your SEO with chatbots. 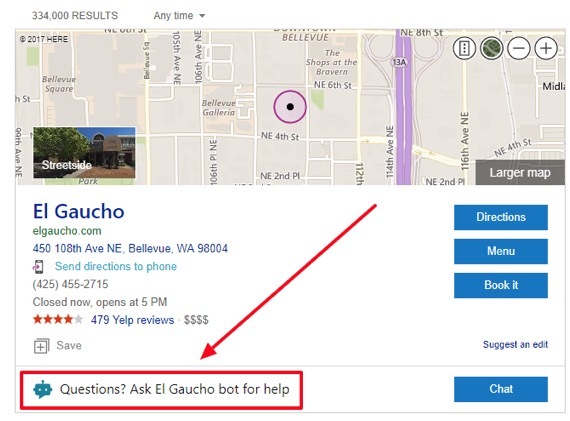 As the chatbot feature of Bing Places for Business will likely expand beyond just restaurants soon, marketers should be ready to take advantage of the features these chatbots have to offer. Of course, most marketers would want to know whether Google will begin offering similar features on their SERPs. Given that Google has pretty aggressively incorporated mobile app results into their search pages, and that the search company has integrated their own bot into their Allo messenger app, it seems likely that in the long-run they will find ways to add bots to Google search. 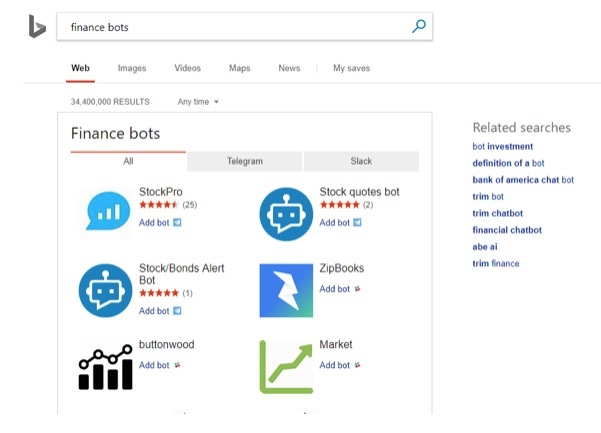 In the meantime, creating your own chatbot for Facebook, Slack or another platform is a great way to rocket to the top of Bing search results. Chatbots have gained most of their fame as specialized tools on Facebook Messenger, Slack, and other messaging platforms. But tools like Apple Siri, Amazon Alexa, Microsoft Cortana and Google Allo all use the same AI to help users find the information they need on the web (among other features). 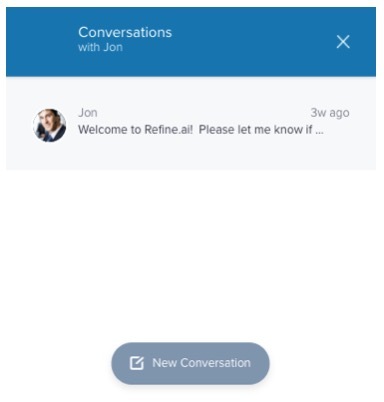 That’s just one example of how search is integrated seamlessly into the chat experience. When using Google Assistant, Siri, or another AI tool, you can also use voice commands to get information. This setup is fundamentally different from how search has been used traditionally. Voice search is much more conversational. For example, a normal text search might be “Computer repair Vancouver, WA,” but a spoken search might be “Where can I get my computer fixed in town?” That changes keyword optimization in a big way. When people search using AI tools like Google Allo and Siri, they receive specific recommendations, not a page full of search results as with a traditional search. It’s hard to know what causes different chatbots to choose one recommendation over another, but some factors are very obvious. 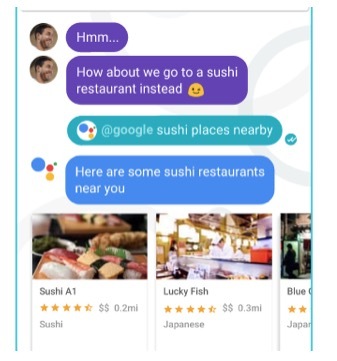 See those sushi restaurants listed in the Google Allo screenshot above? They all have a 4+ star rating. Allo isn’t likely to suggest businesses with a poor star rating. So suddenly getting positive Google reviews is way more important than optimizing for certain keywords. That’s another big change in SEO. Now’s the time to start optimizing for chatbots, not search engines. Take full advantage of the tools Google and other AI technologies use to make recommendations (e.g. fill out your Google Business Page, encourage positive reviews, use rich snippets). You can also start optimizing your keywords for message-style conversations (like with Google Allo) and voice search as well. Here’s a helpful resource on voice search optimization. Chatbots aren’t just appearing in messaging apps. Businesses can also integrate them right into their websites to improve user experience as well. As you probably already know, on-site user experience is very important for SEO. Anything you can do to make your site more accessible to users, decrease bounce rates and increase time on site can have an impact on search rankings. According to official Google statements, nearly 60% of searches now happen on mobile devices. This trend has been coming along for a long time now, so Google is prioritizing mobile friendliness in search results. And what’s more mobile friendly than a chatbot? People are used to, and even prefer, messaging over other forms of communication. Even if a web page is mobile friendly (it has a responsive design that adapts to your device’s screen size), people face challenges consuming content on a mobile webpage. Navigation is more difficult (usually the navigation buttons are truncated on the small screen and difficult to read) and there’s a lot of scrolling involved to see the different elements of a page. But it’s possible to get around these challenges through the right implementation of a chatbot. 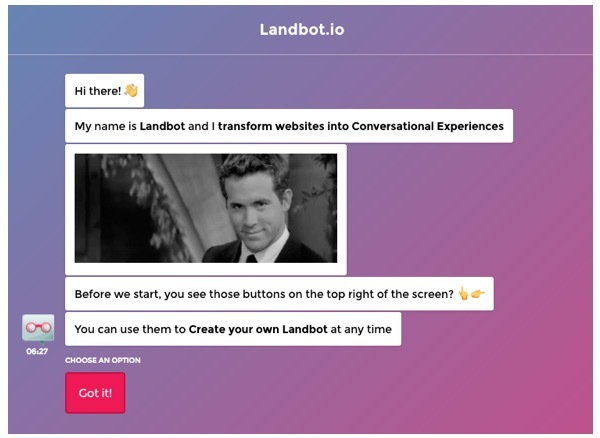 By incorporating a chatbot on your landing page, you can enable your mobile site visitors to chat with your landing page messenger-style, instead of scrolling through it. Visitors can ask it questions, and your bot can provide the relevant information they’re asking for, instead of leaving them to find it on their own. 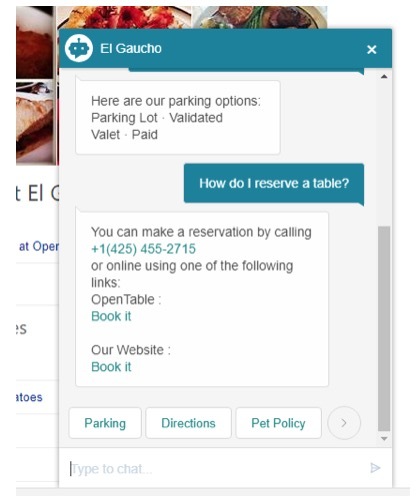 By engaging site visitors in a conversation, chatbots can provide an experience customized to each site visitor’s unique needs. It can also suggest other pages on the site to visit, increasing clickthrough rate and time on site, all great for SEO. Chatbots can be used directly on your website to improve your user experience, thus having a positive impact for your site’ SEO. This is particularly true on mobile. If you’re already creating a chatbot to rank better in Bing results (mentioned above), it should be pretty easy to integrate the same technology into your website to help visitors navigate your site or provide customer service. Chatbots are quickly changing the way people access information online. Marketers interested in improving their SEO should start envisioning search in the context of messaging for the future. Developing your own chatbots and optimizing your webpages for the search features of other chatbots is a well-rounded strategy to stay on top of the SEO game. Guest article written by: Michael Quoc is the founder and CEO of Dealspotr, an e-commerce platform that connects emerging brands, lifestyle influencers, and savvy shoppers around today’s best deals. Wonderful post! You explained very well about how chatbots are already changed seo game. I truly love how it’s easy on my eyes as well as the info are well written.This info is very useful and I will certainly save the bookmark With thanks. This is very helpful. Definitely something to look out for. Since we’re in the very early stages, now is the time to learn what you can and get a jump on the competition for search optimization.